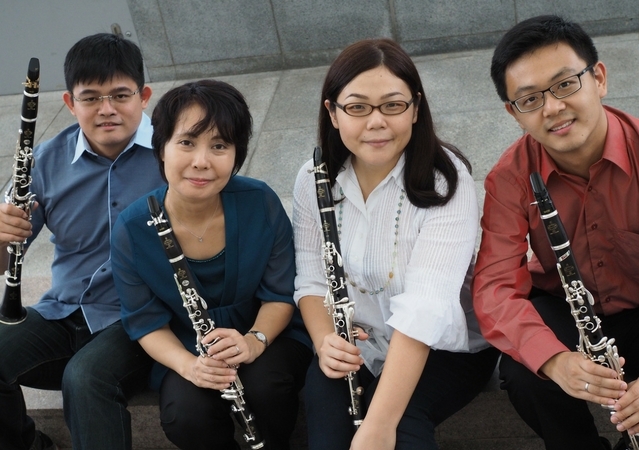 The Clarinet Concord, Singapore’s first professional clarinet quartet, brings together four of the island republic’s finest clarinet players. Each hailing from diverse, colourful, musical backgrounds, setting out on individual paths which have converged at this cathartic melding of musical minds. Comprised of Singapore Symphony Orchestra members Yoko Liu, Li Xin and Philharmonic Winds members Satsuki Goh and Desmond Chow, this musical maelstrom has swept through audiences, leaving them spellbound and mesmerized with their virtuosic playing, dynamic expressivity, all focused through the lens of a multicultural asian perspective. Since its inception, the Clarinet Concord has been extremely active; from recitals at Yamaha and the Flute And Music Academy to performing as invited artists at the inaugural Singapore Woodwind Festival, the Esplanade Concourse, outreach performances and engagement concerts at public schools and institutions, the group’s performances have been well received and described by many as ‘mesmerizing’ and ‘truly resplendent’. In a bid to extend their repertoire beyond the established for the clarinet quartet, the Clarinet Concord continuously seeks to renew interests and interaction with the clarinet amongst the general public and music lovers alike. These are done with the commissioning of new or popular arrangements where recent forays into movie soundtracks and pop arrangements have been met with rave reviews and a fast burgeoning fan base. In a bid to arrest flagging public interest in classical music, as well as to foster a new generation of budding clarinetists, Clarinet Concord have, in partnership with The Band World, started a coaching initiative for young students and beginners of the clarinet. This will allow young students to fan the early sparks of interest in the clarinet by working closely with professional players as well as to foster a solid foundation in their playing. The Clarinet Concord hopes to bring their music and the message of musical renewal into neighboring countries and ignite a regional musical zeitgeist with the wonderful sounds of the clarinet.